Planning the perfect vacation can be quite the jungle. 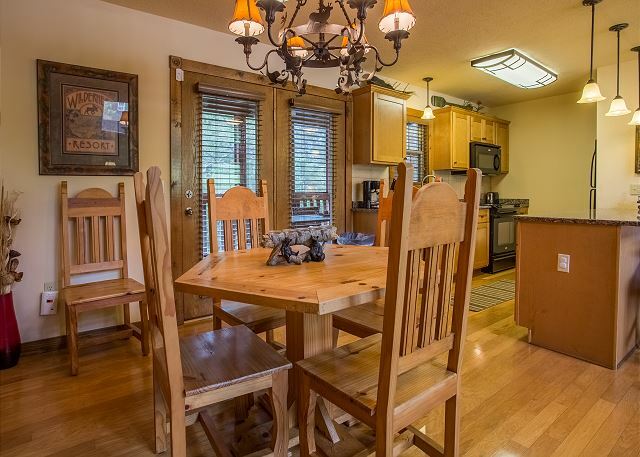 Make it simple by renting this beautiful 4 bedroom cabin! 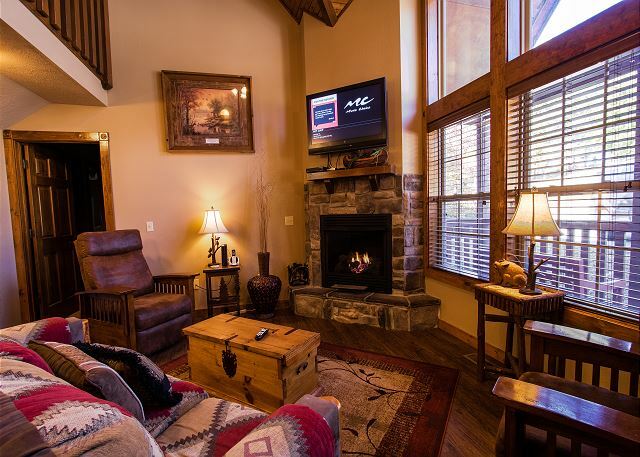 An enchanting place to behold, this magnificent cabin is located in Stonebridge Resort. 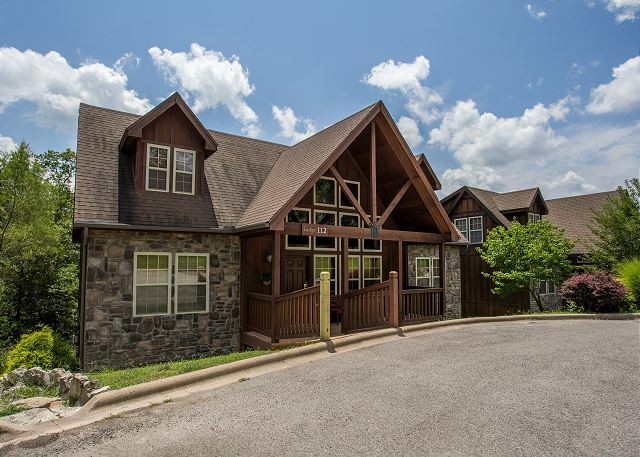 Nestled perfectly in the rolling Ozark Mountains, there is an abundance of breathtaking wildlife all around you! And with the glorious and rustic architecture of Stonebridge, you will feel an air of sophistication like no other. 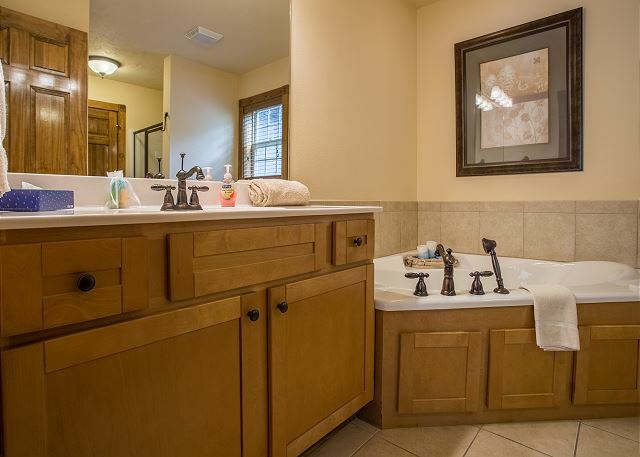 Whether you choose to relax by the two outdoor swimming pools, or cast a line into the catch and release pond, your days will be filled with splendor at Stonebridge. After you explore the resort, come back to Wilderness Lodge and relax. This home is incredibly spacious, so don’t be afraid to stretch and spread out to your heart's content. 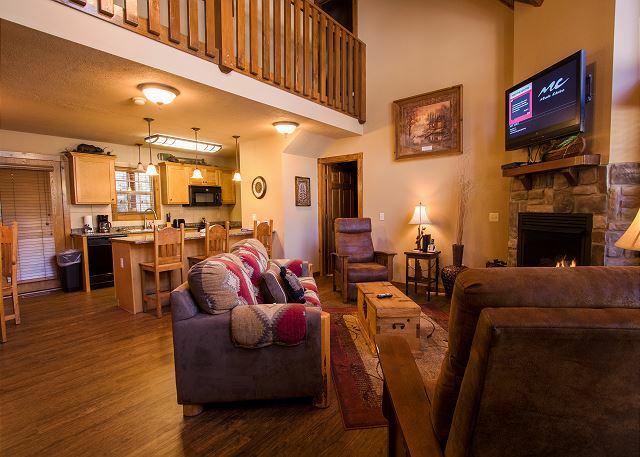 Check in with everyone back home using the complimentary wi-fi, or just settle down and watch your favorite shows on the flat screen TVs. When you need a pick-me-up, brew some fresh coffee in the full kitchen, or whip up something delicious to eat. 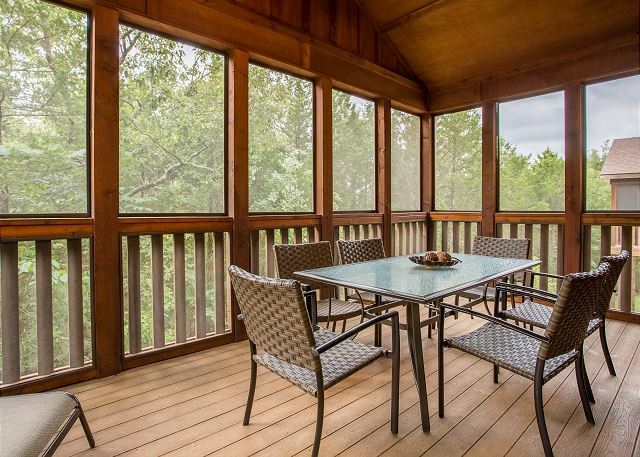 To wrap it all up, take a seat in the screened in porch and talk about all the fun you had with your family as the sun sets over the Ozarks. Great stay! Very comfortable with lots of room. Wonderful place to stay! We enjoyed Silver Dollar City while in Branson. The golfing was beautiful. Great facility! Very comfortable and pretty place. Needed more wash clothes but other than the distance to get there, very nice place. Loved every aspect of our stay from the directions to get there to the security, to the amenities and the overall satisfaction with the lodge itself. Quiet, peaceful, and relaxing. A wonderful get-a-way!! All of our family was able to stay for two nights. It is very convenient to Silver Dollar City! The lodge was very clean and many items needed for cooking are available. We had a wonderful time and plan on returning sometime in the future!! The directions given to us were a little hard to follow. The street signs are very difficult to read after dark. The dumpster is too far away from the lodge to dispose of trash when leaving. The house was very spacious for 4 couples and 2 toddlers. Loved the outdoor screened in porch perfect for kids to play around. The surrounding area was very beautiful with a pond and playground near by. 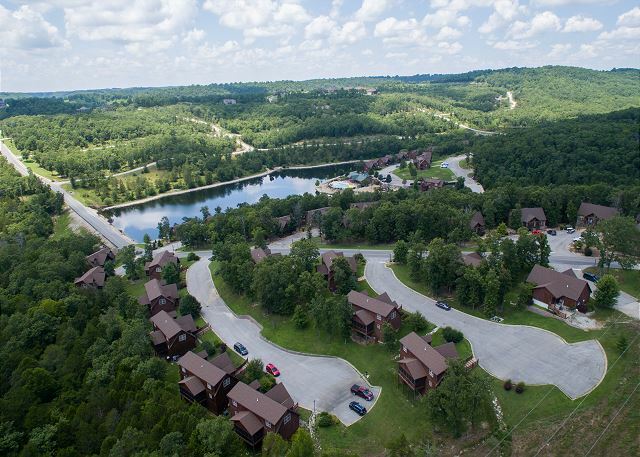 The only disadvantage was that is was pretty far away from everything in Branson and it took at least 5 to 10 min to get out of the neighborhood itself, but it is right next to Silver Dollar City. Good morning, Ronnie! We're glad that you had a good time at Wilderness Lodge! We hope to see you again in the future, and don't hesitate to call and ask about properties that are a bit closer to Branson. We have plenty! Be sure to mention your previous stay with us as well to receive a returning guest discount! Our FarmGirl Sisters group stayed for three nights, four days and never left the cabin! It was a fabulous retreat weekend with all the comforts of home! Well appointed cabin, fabulous screened in deck was a huge plus. Amazing, rooms where spacious. Loved the big covered patio. Our teens enjoyed playing sand volleyball and relaxing at the pool. Can't wait till next year ?? We had a family vacation with 8 people. The house was perfect. Everyone had their own space. We had such a great time we are planning on coming back. 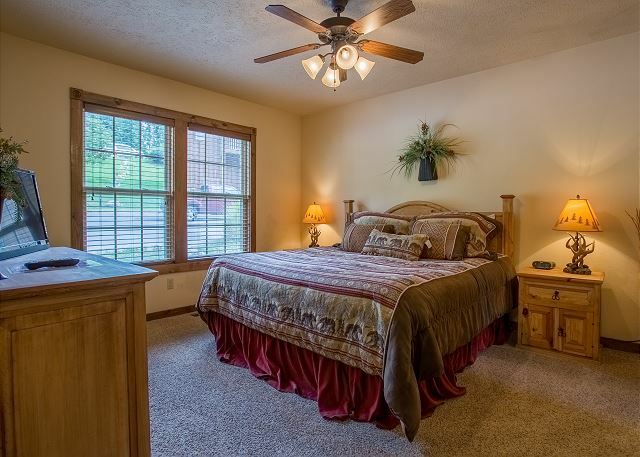 Location is quite a distance from main road but was close to pool, lake & very quiet & private. It could use new mattress in some bedrooms. We had a wedding on the property and reception at the cabin. We loved the experience we are definitely planning another trip. We had a wonderful stay at your lodge! I'm sure this will be the first place we check when we make another trip to Branson. The lodge was clean and comfortable. very nice and fun. Maybe use a few more trash bags and dishwasher soap. With 4 rooms we used the disherwasher everyday for 5 days. What do you think. We did appreciate our service and how clean it was and ready to go. Thank you. This house is perfect for four couples wanting to stay in one place. The bedrooms are very spacious. 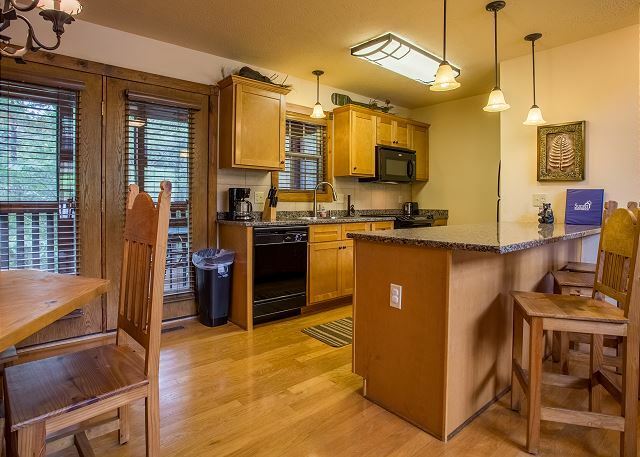 The living room/kitchen area is a nice, open space. The screened in porch is lovely. This particular property is WAY back in the "Wilderness" so it does take a few minutes to get there once you pass through the gate. Overall, we were very satisfied with our brief stay. we had a wonderful stay at Wilderness Lodge. 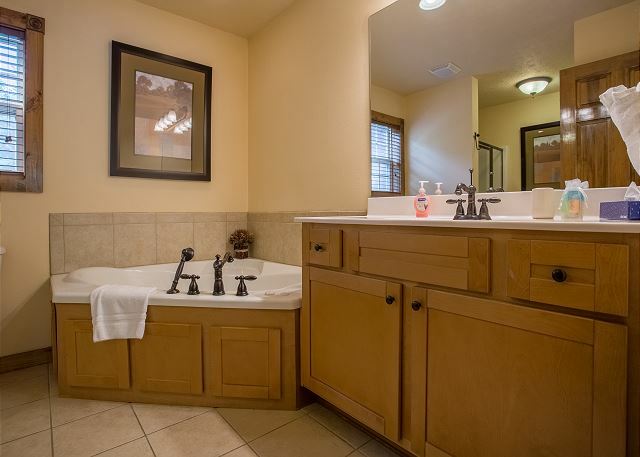 Each couple liked having their own private bath off their bedroom. The cabin was clean and had everything we needed. Eating on the screened deck was wonderful. We had such a good time everyone wants to do it again next year at the same place. First time all four cousins were together in over 20 years. Our family spent Labor Day weekend at this cabin in the Stonebridge community. 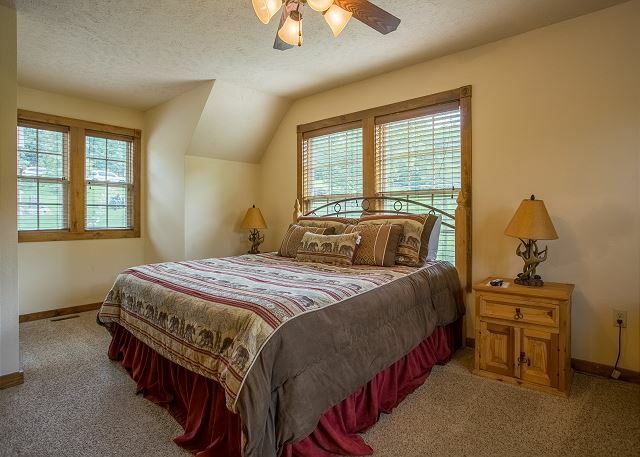 The four bedrooms with four baths worked great. The screened in porch on the back surrounded by trees is very nice. The cabin size and layout was perfect for us. Quality was great. Only 2 negatives. 1 ~ large vent by from door was very dirty...dirt falling off in chunks. 2 - Long ways into the development, so may not choose to stay there again. This was our first time to visit Branson!!!! We loved it well worth the drive we will be back!!! The cabin was phenomenal the views were amazing! Very relaxing it was a great time for the entire family!!! It was the best. 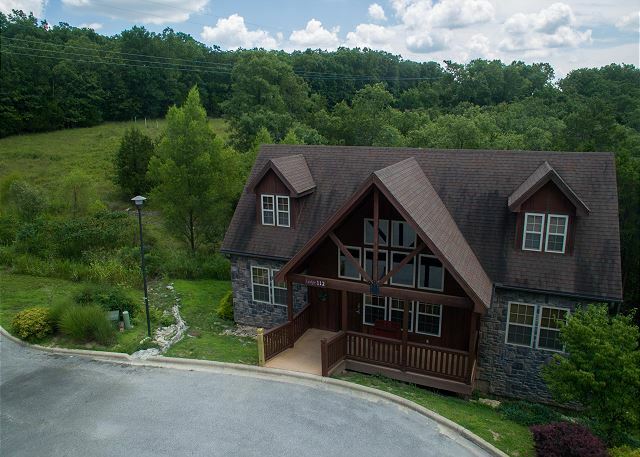 I loved that 4 bed/bath cabin and we are going to book it again. It was so peaceful. And plenty of room for my family. Great experience. We will rent here again. 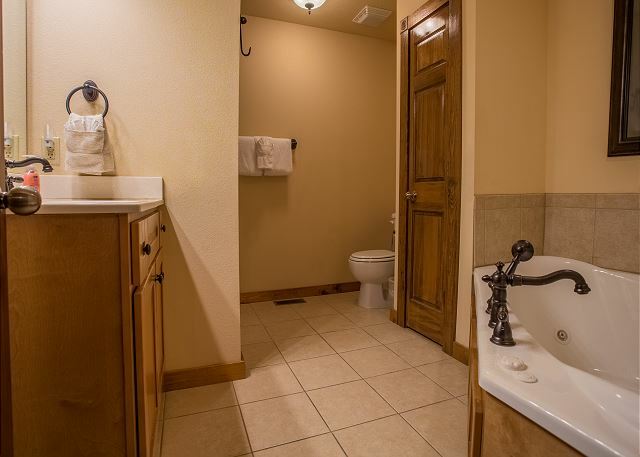 I really like the private bathroom for each bedroom. Thank you, Harold. 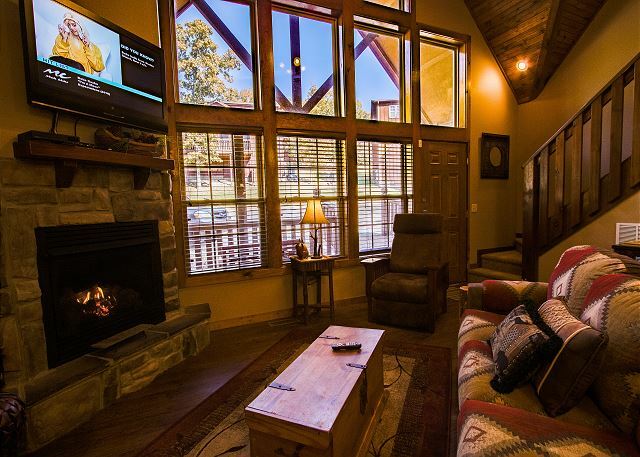 Glad you enjoyed the cabin and we hope to see you back soon! We could not have been more pleased with our Cabin. 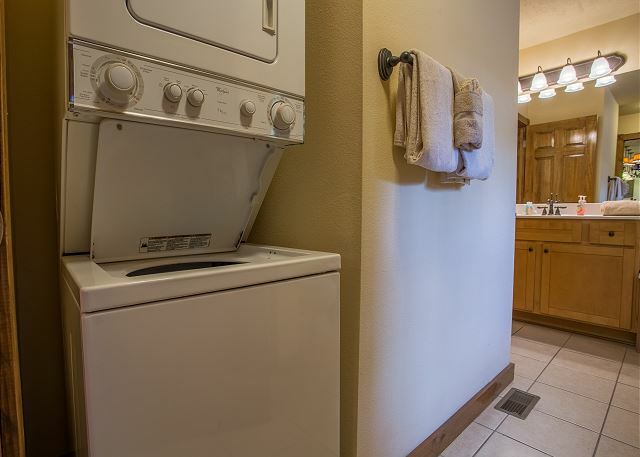 The location was close to all of the major attractions. The condition of the cabin was spotless. The kitchen was fully stocked with cookware and having a dishwasher was wonderful. I can't wait to book our next trip! Thanks, Mollie. We are glad you enjoyed your stay. Come back soon! The cabin was clean, ready and very nice. Everything went as it should have with no surprises. Thanks, Lee. We are happy that everything met your expectations. Come back soon! 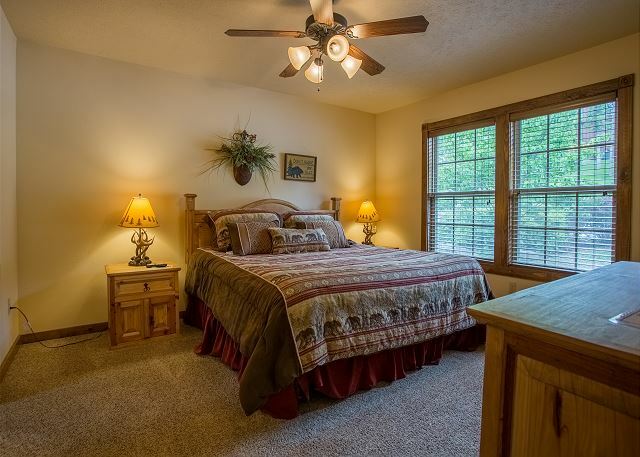 We rented this unit for a family vacation with my parents and siblings, and our spouses and children. The location was secluded so we felt like we were really getting away from it all. It was great for the kids to be able to play safely outside. The rental house was quiet and comfortable, and I don't believe we would have enjoyed our trip as much had we stayed anywhere else. Thank you for the review, Jennifer. We're glad that you enjoyed your stay. We hope to see you back soon!